is one or several heatpipes connection hotspots with cooling areas. Normally the heatpipe gives the basic shape of the cooling system. For cooler systems also the ADEO_low Temp (-LT) heatpipe can be used in combination with TE (peltier) moduls. Or hotspot's on an assembled circuit board can be connected and the heat moved to a cooling section (like heatsink) or the heatpipe has already assembled fins for fan cooling. We do design support, tools, fixture, production, marking and testing at ADEO. very common are all kind of fan cooled heatpipe systems. ADEO is open to all kind of custom-made designs. The market shows to our customer a very wide range of design freedom. We support this market trends with adding plastic molds (air guide) or die-cast parts (ruggedized application) and/or steel punched parts. 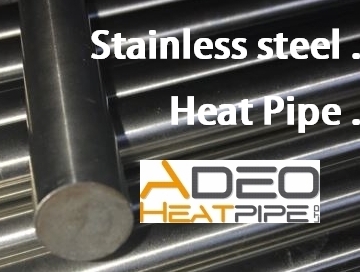 Selling heatpipes without any treatment, support, nor testing is not the aim/goal of ADEO. If you have inquiries in OEM quantities pls contact us. We support mainly requirements for machine- and control-units industry, medical industry, white goods and at "C" & "D" classified parts in the automotive industry.